CleanPlex® NGS Panels feature a rapid, single-tube workflow* that can be completed in 3 hours and requires only 75 min of hands-on time. High-quality target-enrich libraries can be easily and quickly prepared for faster time to results. Single-tube workflow* minimizes sample loss to preserve genomic information in the sample, and reduces the likelihood of errors and sample mix ups to ensure positive sample identification. * Single-tube workflow. A single-tube workflow is followed when using a single-pool CleanPlex NGS Panel. For a multi-pool CleanPlex NGS Panel, the individual mPCR products from the primer pool-specific reactions are combined into one tube, and the remaining protocol is carried out using a single-tube workflow. CleanPlex’s streamlined workflow requires few steps and pipetting operations to convert input DNA to target enriched NGS libraries. The protocol requires no mechanical or enzymatic fragmentation, no lengthy and laborious hybridization procedure, and no expensive equipment. This means CleanPlex protocol can be easily trained and consistently performed between replicates, runs, and operators, ensuring high reproducibility and reliability in the data obtained. High reproducibility. Eighteen CleanPlex libraries were generated by 3 operators and sequenced on an Illumina platform. The GC coverage of the libraries were plotted and compared against each other. 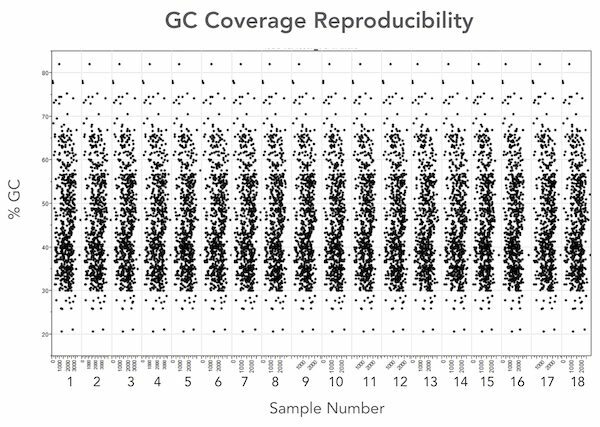 The libraries produced highly reproducible GC coverage profiles, yielding a Pearson correlation coefficient of 97.26% ± 1.07%.